Students budgets will be finalized and handed in as an assessment with approval from their parents. · What can be considered personal income? · How can personal expenses be categorized? Students will play the Game of Life using the Life Short Rules and keep track of their income and expenses on the Life Spreadsheet. This information will be used to complete their tax return at the end of the Unit. By playing the Game of Life, the students will compile the information needed to fill out a complete Form 1040. Makeup: if you missed gameplay days, download the game here and play it on your own, keeping track of your expenses and income on the spreadsheet. · What is the purpose of a federal deduction on your income taxes? Students will continue to play the Game of Life using the Life Short Rules and keep track of their income and expenses on the Life Spreadsheet. This information will be used to complete their tax return at the end of the Unit. By playing the Game of Life, the students will compile the information needed to fill out a complete Form 1040. 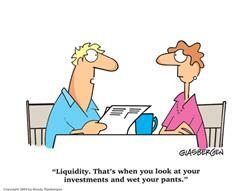 Essential Questions: Why is liquidity important? Students will cash out of their Stock Market game portfolios, totaling the final value by calculating dividends, broker fees, and capital gains/losses. · Why are personal financial records important? Students will compile the information from their Final Stock Market Portfolio (which should have been posted on the class blackboard blog) and then fill out a Form 1099 DIV, 1040D, and 8949 on their dividends and capital gains with the teacher’s help. This will happen in individual consultation with each student. Students will go home and start to incorporate their financial information into their 1040 form. They are free to ask for help from their parents. · Is the US Progressive Income Tax Efficient? · Students will transfer the exemptions and deductions from their Life spreadsheet using form 1040A. They will determine whether to use the standard deduction or itemize, and then calculate their taxable income. Student will work on their 1040 form using their Life spreadsheet with the teacher’s help. · Is the US Progressive Income Tax Fair? Student will complete their 1040A and tax assessment form. In-class discussion on the fairness and efficiency of the US Tax system. Students will turn in their tax records (SMG portfolio, Life spreadsheet), their tax forms (1040, 1040A, 1099Div), and their tax assessment form. This MUST be turned in at the END of class – this is a SUMMATIVE ASSESSMENT and any assignment turned after class will be penalized 1 point per day late.